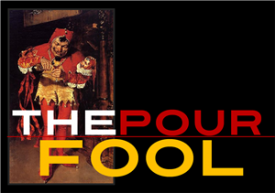 In the beginning, The Pour Fool was supposed to be a blog about just wine. I had no intention of writing about beer, being completely immersed in the wine biz, at that point. I didn’t even think about doing beer reviews, even after I got my first twelve emails, all asking that same question. Finally, in late September of ’09, I decided that, if so many people wanted beer included, I’d do beer. The Pour Fool is not my vanity project. It’s about giving those who read it information and if the emails has asked for cider, ice cream, or electrical pump reviews, I’d be covering those today, I suppose. By one week after that first beer post, I had forty-six more emails about rating IPAs. This is One Guy’s Opinion. This is also composed of only the IPAs that I have tasted, so if yours isn’t here, I either haven’t had it or didn’t think it was as great as you do. One last thing: You will notice that there is no Pliny here, Elder or Younger. I’m not apologizing. I don’t like either one of ’em. If it makes you feel better, insert them wherever you like but don’t waste both our times observing that they’re not here. They’re not here entirely on purpose and I wouldn’t change that for anything other than a sudden reformulation of both. I’m not attempting to dis either one. Obviously they’re great, wildly popular ales. But this is a list of what I, Steve Body, your Pour Fool, find great and appealing and those didn’t make it. They were, however, both in that thirty mentioned at the very end. White Oak Jai Alai/Cigar City Brewing, Tampa, FL: Hoppy, sure, but so much more than that. This is the only IPA – or any beer, for that matter – that showed distinct flavors of coconut flan and pie crust. The vanilla and woodsy barrel notes are swoon-inducing. Is it the bitterest? NO. And if were, it wouldn’t be the first one I mentioned. What I’m looking for in any beer is something distinctive; traits that remove it from the run-of-the-mill. This is one of the most distinctive beers made by anybody in the US and it haunts my memory like a very sweet-natured ghost. Workhorse/Laurelwood Brewing, Portland, OR: Folks outside the Northwest may not know this beer like we up here do but this has been a spectacular, slam-dunk icon since the day of its first release. This is everything an IPA should be and nothing it shouldn’t. Bitter as an ex-wife, smoothly malty, powerful, assertive, and possessed of one of the best finishes of any beer, anywhere, Workhorse was named and conceived to be a BIG IPA you can drink again and again. And it is exactly that. 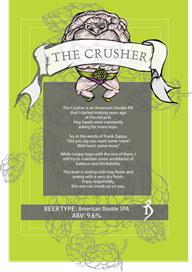 The Crusher/The Alchemist Pub & Brewery, Waterbury, VT: The Bad Boy big brother of The Alchemist’s immortal “Heady Topper”, this is a brutally straight-forward, complex, utterly delicious Imperial that sent literal chills up and down my spine at first sip. The hops show every aspect that can be coaxed out of those magical buds: sweet herbs, resins galore, wildflowers, and every citrus peel you can think of. The malt character civilizes it just enough to make it approachable, so that even the most timid newbies and the most hard-core HopHeads can enjoy it together. A truly unique and special beer. Hop Venom/Boneyard Brewing, Bend, OR: Sort of the punk-rock version of Workhorse, this is more about aggressive bitterness and naked aggression. It does have a lovely, chewy core of caramel-tinged malts but they definitely lay back and let the massive blast of Pure Resins have the spotlight. Tony Lawrence and crew embrace a real, unphony post-Grunge aesthetic in their graphics, lifestyle, and their beers. It’s a refreshing shot of urban grit in the Oregonian sea of tree-huggers and they make it work in every ale. 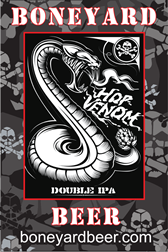 If you claim to be an IPA fan and you don’t try Hop Venom, your Hops Journey is NOT complete. Heady Topper/The Alchemist: Two beers in the first five on this list? Yep. It was just undeniable. Heady is the suave city-slicker to The Crusher’s Urban Thug. Smoother, less punishingly bitter, Heady is still among the purest, most delectable pints o’ hops you will ever taste but it has this uncanny polish and other-worldly smoooothness that almost defies its uber-hops character. The resins run to spruce tips, rather than just the typical pine and the citrus shows pink grapefruit and a remarkable blood orange tinge that makes it almost tropical in nature. There’s a reason this stuff is usually named as America’s Best and I could have easily done the same and felt perfectly okay doing it. Jai Alai IPA/Cigar City: The “regular” version of this immortal IPA is still one of the country’s best and the proof is in every can. HUGE citrus notes, jasmine, ginger, flowers, mild herbs, mellow malts, and half a dozen little grace notes like papaya and melon and honey biscuits and chamomile flit by and light up the flavor as it warms. I like to clutch the can in both hands and hasten that along but it is so satisfying even cold that I rarely do it. This is and deserves to be one of America’s hallmark IPAs. Furious IPA/Surly Brewing, Minneapolis, MN: Furious is aptly named, as is its surly cousin, Abrasive. Uncomplicated concept meets perfect execution, Furious delivers what the modern Hophead wants: a full-frontal assault of grapefruity, herbal hops, relieved a touch by a sneaky malt core that develops as you sip and diffuses – a BIT – the hops that might otherwise take your face off. For all its Attitude, it’s maddeningly delicious and mouth-watering; one of the most compulsively drinkable big IPAs made by anyone. Surly is killin’ it and even their two epic IPAs are just the prologue to the story. Blimey, That’s Bitter! Triple IPA/Reuben’s Brews, Seattle, WA: Yeah, I know: you never heard of it. Well, get ready. Adam Robbings, Reuben’s brewmaster, is bottling this and if you’re a HopHead and you don’t find some, you’ll miss one of the serious template Triples made in the US today. This is what future Triple IPAs will taste like. Robbings, a mail-mannered English transplant, was one of America’s premier homebrewers just two years ago and his Reuben’s ales have been a wild success and universally praised. This may very well be his Magnum Opus. Perfect balance of hops and malts is what first shows itself and then it finishes more and more bitter until you’re left saying, “Wow! Just…wow!” It just today won The2014 US Beer Tasting Championships for Best Imperial IPA in the Northwest and we can all count on more accolades to come. Ruud Awakening IPA/Old Schoolhouse Brewing, Winthrop, WA: Yeah, yeah, let the shouts of “Homerism!” begin. They’ll fall on deaf ears, though, because Ruud Awakening was named Grand National Champion for IPA at The United States Beer Tasting Championships, and deserved to. Winthrop is about the size of Imelda Marcus’ shoe closet and very near the End of The Earth but brewmaster Blaze Ruud and crew don’t seem to recognize their obscurity. This is a fabulous, complete, eye-popping piece o’ brewing skill, showing perfect balance, scary drinkability, and remarkable intensity. Resins and citrus mesh beautifully with caramel malts and a silken texture. This is my pick as Dark Horse IPA for the entire US. Two-Hearted Ale/Bell’s Brewery, Kalamazoo, MI: Near-perfect, as drinkable an IPA as you’ll find in this lifetime, Bell’s gorgeous Two Hearted delivers a truly magical marriage of everything craft beer is about: Hops, Yeast, Grains, and water. All of this is in Balance, nothing forced, nothing obscuring the magnificent Centennial hops that are the ONLY variety used in this remarkable, addictive ale. Dirt Wolf Double IPA/Victory Brewing, Downington, PA: Victory’s beers – every single one – are nearly perfect. You may not care for the style, sometimes (and I admit to tasting a couple that I could take or leave) but they are always beautifully made and this big, strappin’ DIPA is one of their very best. Balance is the key here. The fat, resiny Citra, Chinook, Simcoe and Mosaic hops marry beautifully with the subtle two-row malts to give this crazy drinkability and flat-out delicious appeal. Notorious Triple IPA/Boneyard Brewing: It would be glib and cool to call this Hop Venom’s Big Brother but it would also be a lie. It’s not. Notorious is its own animal and “animal” is a great word for it. This is a savage beast of an IPA; a huge, uncompromising, mouth-filling sumbitch of a beer that explodes on the tongue with an aerial assault of herbs, sap, tangerines, lime, lemon, and grapefruit. The malts are subtle but effective. 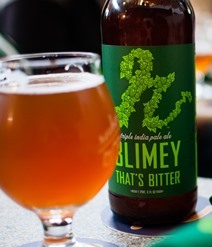 Newbies could drink this but it takes an adventurous palate and a real lust for Hops. That said, for those of us who appreciate the Power of the Flowers, this is one of the ultimate experiences available in American IPA. 90 Minute IPA/Dogfish Head Brewing, Milton, Delaware: Practically the template for the extreme IPA, 90 is better for me than 120 mostly because it’s a little easier to find. But it’s also every HopHead’s go-to ale, one that will always satisfy the lupalin addiction and give unfailing drinking thrills. Tricerahops Double IPA/Ninkasi Brewing, Eugene, OR: I’ll make no bones about this: Tricerahops is my favorite IPA to just sit and sip when I want something I KNOW is going to be spectacular. It’s one of the two or three most complex IPAs I’ve ever tasted and emphasizes the floral character of its hops, rather than herb/resin/grapefruiting you to death. It is also THE most approachable DIPA for newbies and as drinkable a strong ale as you will ever taste. Myrcenary Double IPA/Odell Brewing, Fort Collins, CO: So, you haven’t tasted anything from Odell? LOSER. Get out there and find their beers, even if you have to go to Denver to do it. And start with this – dare I say it – elegant DIPA that slaps you silly with complex, juicy hops and then strokes you with laid-back maltiness. The hops lean toward pine/spruce resins but layer on citrus, wildflowers, and sweet herbs, too. A stand-out ale from a titanic brewery. Maharaja Imperial IPA/Avery Brewing, Boulder, CO: Keeping it in CO for a moment, Avery’s Dictator Series Imperial just simply hits ALL the right notes: an avalanche of herbal/citrus hops, background malts, velvety texture, and enough power for the most devout Lupalin Worshiper. This is probably not the IPA to spring on your aspiring, untested IPA-freak buddy but for those of us who know and love The Hop, this is a perennial favorite. Rampage Imperial IPA/Black Diamond Brewing, Concord, CA: There is nothing at all “California Laid-Back” about this monster IPA…and the thing is, it’s not one of those tedious Extreme IBU jobs. It tops out at a fairly sedate 80 IBU but delivers a hammer-strike hops intensity that many 100+ versions don’t. It’s not especially subtle, just wildly, crazily drinkable and utterly delicious. Hopslam Double IPA/Bell’s Brewery: Intense. That’s your thumbnail of Hopslam. “Uncompromising” would work, too. It layers on the resins with a shovel but attains a wonderful, tight-rope-style balance with a fat malt core that gives it a friendly, Everyman sort of appeal. As long as Two Hearted is made, this will never be Bell’s best…but it would be for just about any other brewery in America. Hoppenberg Uncertainty Principle/River North Brewing, Denver. CO: What Matt Hess and his henchmen have done at RiNo in just three years is astounding. If this were a list of America’s Best Stouts, his Avarice would be on it and very near the top. This was Matt’s first IPA and he nailed it. Belgian yeasts, copious and complex hops, just a hint of spices, a suggestion of sweetness, impossibly smooth texture…just fabulous ale from a brewery that should, if God is in His Heaven, be a LOT more well-known. Dinner Double IPA/Maine Beer Company, Freeport, ME: Man, I love these guys. Not content with making one of the five or six best Pales in America, they whupped up this stuff: big, sunny hops character that doesn’t kick your teeth out, pacified (a bit) with low-key maltiness and given a creamy, uber-civilized texture. Built a bit like Lunch, their basic IPA, Dinner is – or should be – the virtual template for how the Northeast Imperial IPA should taste. I appreciate the way you qualified your remarks. This is the list for that one day when you were in Denver. I haven’t tried everything on this list, but of the ones I have tasted, they are great! By the way, I would love to read your thoughts on Bale Breaker. I love Topcutter. Field 41 is also very good. I’ve been thinking of driving out to Yakima for a visit. I’d urge you to make that trip. Although they usually only pour two or three beers, they’re a really FINE two or three. If they’re not innovating wildly, I think it makes sense for them. They are, after all sitting right in the middle of one of the world’s greatest hop fields. If they’re All About The Hops, maybe they should be. Just damned good beers and a beautiful setting. BTW, if you’re driving over from the west side of the Cascades, I URGE YOU to swing into Roslyn and check out Wild Earth Brewing. I think they’re Washington’s next Game Changer brewery. Uinta Hop Nosh and Founders Centennial would be on my list but of the ones I have had from your list, no arguments. Wish more of these were available in KY.